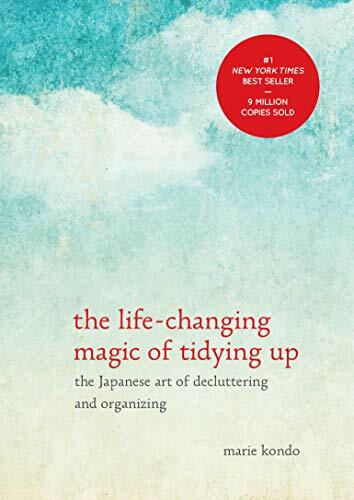 Now personally clutter is one of my biggest problems to tackle when it comes to spring cleaning. In fact, it is downright overwhelming at times, with three kids and our active lives it’s not a surprise. 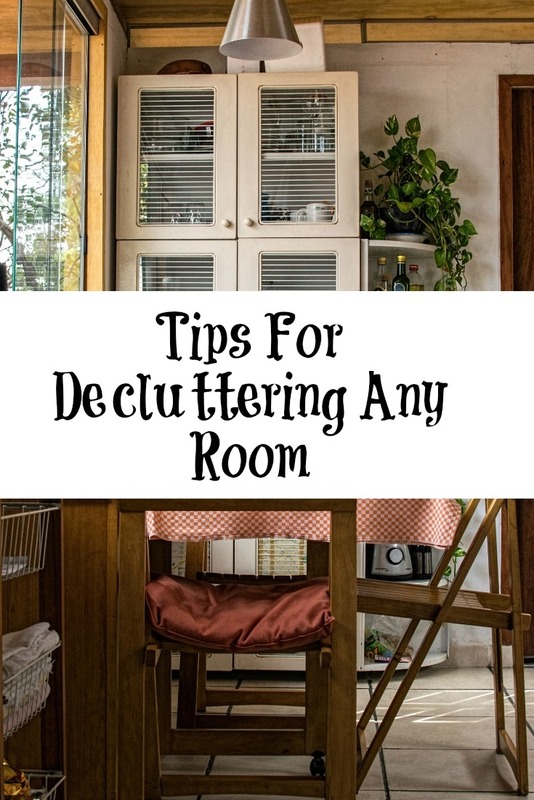 But I have found that are are some easy ways to tackle clutter no matter which room you’re cleaning. These easy tips to easily declutter the room can make it seem less overwhelming and easier to work through. Start any room buy pulling apart everything. Desk, dressers, under beds, cabinets etc so everything that holds things is empty for a fresh start. This works better in some rooms than in others but it is a great way to start the room. And let’s face it if you have kids like me sometimes there are crazy thing hiding in these rooms. First things first, go through the whole room or the big pile you made with a trash bag and throw away any of the trash. It might be a stack of unneeded receipts on your desk or junk mail in the entryway. When you take the time to do this step, everything will go much easier to sort through. How often do items end up in the wrong room? It might be the hairdryer you were using in the bedroom because your husband had taken over the bathroom one morning or even coffee mugs in the bathroom. Gather all the items that belong in other rooms into a basket and then go from room to room returning the items to their proper location. If I am doing multiple rooms on the same day I move these boxes room to room. You might also have items that don’t even belong to you. 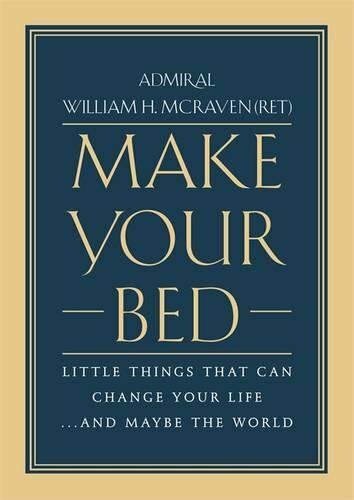 It may just be books on your nightstand that you need to return to the library or a casserole dish a friend brought over. Again, gather the items, sort them, and then return to the owners. It helps to go ahead and place the items in your car so that you can return the items during your next trip out. Have you noticed that every room seems to have its own collection? In the bathroom, it might be makeup or perfume. In the living room, it might be movies. Each of these collections will need to be gone through to remove items you no longer use, are expired, are worn out, etc. Every collection needs to be whittled down at least once a year. Plus you can also sell some of these for some extra cash to pay down debt or to set aside for Christmas fun. Last, but not least, use storage to your advantage. It might be baskets, wall hooks, or even totes. Regardless, use these items to declutter your rooms. For example, you might use baskets under your living room end tables to store throw blankets or baskets on shelves in your bathroom for makeup. 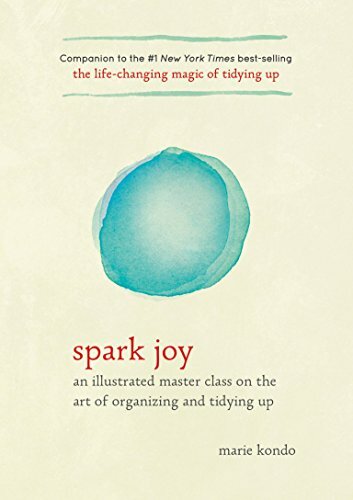 When you create a space for everything, you conquer clutter once and for all. 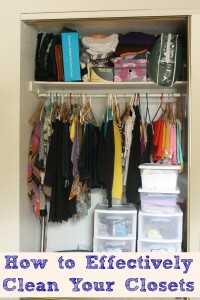 What short-cuts do you have for tackling clutter in your home?? I am in need of a big spring declutter, so thanks for these tips! I have to say, pulling everything out seems a bit frightening, but there’s no turning back at that point is there?! This post came just at the right time as I am getting ready to go through my rooms starting tonight. I especially like the part of getting trashy items out first. And, yes, every stinkin’ room winds up with a collection of some sort! What is it about stuff ending up in the wrong room? For us it is stuff upstairs that belongs down in the basement. Typically my husband’s stuff. 😉 We also struggle with random collections. Decluttering is BADLY needed around here! I try to never leave a room empty handed. I just move things where they go as I move around! Great post! Thank you of sharing! I can’t wait to declutter my home!! Great tips! Great ideas! This is how I go through and clean as well! Seriously, having a toddler things are always ending up in the wrong room. Toys everywhere, kitchen tools in the toy box, clothes strewn about because he just wants to walk around with them. Love these tips! Oh, I do love a good declutter. One of my best tips is to get the stuff out of the house as quickly as possible. My husband loves to have a garage sale but I can’t stand having everything hanging around until he gets around to arranging one. I take everything I want to get rid of and put it straight into the boot of my car. The very next time I go past a Good Samaritan’s or other goodwill type shop, I drop it all off. I love straightforward tips like yours, Jenny. Clutter can be a pain and people postpone taking care of it. Spring cleaning is the ideal time to get rid of the excesses. Great ideas! I am a little nervous about pulling everything out first – but I think you are right.